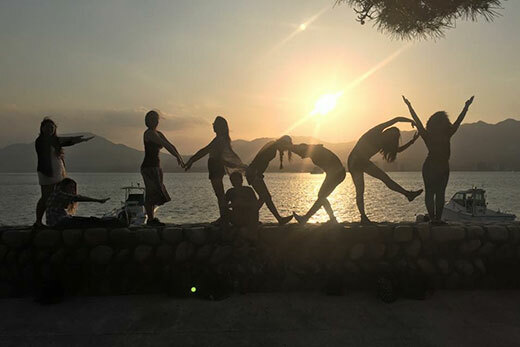 Students on the “Seeking Peace” trip to Japan pose for a photo spelling out “Emory” as they visit Miyajima Island near Hiroshima. It was during a Religion 100Q class that Oxford College sophomore Kimberly Reynolds began to consider the fate of Japanese children in the aftermath of the atomic bombings of Hiroshima and Nagasaki in 1945. Photographs from that time told a tragic story, as young, orphaned children with haunted faces wandered streets of rubble looking for help. Reynolds, who plans to attend the Nell Hodgson Woodruff School of Nursing this fall to pursue her interest in pediatric mental health, wanted to know more about what became of those small survivors. On May 10, Reynolds and eight other Oxford College students joined Jill Adams, visiting assistant professor of religion at Oxford College, and Molly McGehee, associate professor of American studies in Oxford's Humanities Division, for a travel experience entitled "Seeking Peace: Embodying Peace and Justice in Postwar Japan." The trip is offered through Global Connections — an Oxford College co-curricular program designed to help students create meaning in their lives while connecting their religious and spiritual convictions with justice issues that include peace, poverty, human rights and the environment. Housed in the Pierce Institute for Leadership and Community Engagement and the Office of Religious and Spiritual Life at Oxford College, the Global Connections program over the last eight years has taken Oxford students and faculty to locations ranging from Poland, Vietnam and Turkey to Costa Rica and New York City. With an emphasis on leadership and social justice, "this is an experiential learning program that steps outside traditional classroom walls to focus on issues of social responsibility," says Adams 01OX 03C, who has been named assistant director of Oxford's Center for Academic Excellence. Within the mission of Global Connections, "it was the 'peace' part that caught my eye and my heart," acknowledges Adams. While the group won't still be in Japan for anniversary commemorations planned in August, they will be "looking at sites of catastrophic loss — and narratives about those losses — in both religious and secular spheres," she says. "We think we know what peace is, but people use that word, that ideal, in very different ways," Adams says. "This trip will be an opportunity to think differently about these ideals, for students to probe a different part of themselves." "I want students to look at how words of peace and justice are employed in dialogue, and how they motivate political activity, too," she adds. Currently underway, the 12-day trip will include stops in Tokyo, Kyoto, Osaka and Hiroshima. At each city, they will explore "major memorial sites and peace museums to compare and contrast different kinds of discourse, their messages and what makes them distinct," she says. "The sites often share a vision, but they can be quite distinct in how they present their messages." In Hiroshima, the group will tour the Hiroshima Peace Memorial Park, which was built upon an open field created by the nuclear attack, and visit with survivors of the Hiroshima and Nagasaki bombings known as hibakusha, a Japanese word that translates as "explosion-affected people." "We're also going to religious sites and post-bomb art galleries and will be working with a Buddhist organization that focuses on international peace-making in order to see how peace, social justice and community outreach are understood outside the context of the bombings," she says. During the trip, students will blog about their experiences. Once back, formal seminars will help them process what they've learned and observed. Growing up in Chicago as the first-generation son of Filipino immigrants, Oxford sophomore Justin Sia recalls hearing family stories about tension and conflict that existed between Japan and the Philippines during World War II. He applied to join the Global Connections trip to learn more about Japanese politics. "It's really interesting to me how Japan, one of the world's most belligerent nations in the world only half-a-century ago, is now one of the most peaceful," says Sia, who is majoring in political science and economics. "To see the Hiroshima bombing memorialized as a park, where you can step into historic spaces and meet survivors — that's an experience I never would have had without the program," he says. An interest sparked through her work as president of Oxford College's Interfaith Council led sophomore Becky Henkind to apply for the program. "It's always exciting to explore new aspects of a culture," she says. "I like that we're going in with a focus on peace, opening exploration in ways that can't be defined by a classroom." For Adams, the trip is something of a homecoming — her first visit to Hiroshima was during graduate school as a tourist. She had been hiking in the mountains along an old trade route, when she detoured to visit the Hiroshima Peace Park and Museum. "I was leveled," Adams recalls. "There have been few times in my life when I've been that moved, that drawn into something. I think it marked a big shift in my own scholarship." "One of the most important things I'd like to share with my students is the life of memory — the fact that memory is an ongoing and politically charged process that has to be thought through and grappled with in intentional ways," she says. "And I want them to understand ways that peace and justice can take on multiple meanings in the course of that life of memory, and then, as emerging leaders, they can start to forge their own paths to peace." View more information about the Global Connections program.